In 2012, World Health Organization (WHO) published an article on household air pollution, stating indoor air pollution is one of the top five environmental health risks which cause one out of eight people deaths. This rising frequency of deaths and health issues due to air pollution is driving the demand of residential air purifiers. Mounting exposure to air pollutants is giving rise to respiratory diseases or severe condition of chronic obstructive pulmonary disease (COPD). In 2012, around 430,000 premature deaths are caused in European region due frequent exposure of people with high levels of fine particulate matter (PM2.5). As per European Environment Agency (EEA), every year nearly 400,000 deaths incidents occurred due to air pollution in Europe. Growing prevalence of severe health conditions due to indoor air pollution is increasing the adoption rate of residential air purifier across the world. In 2016, Kent RO Systems and Hindustan Sanitary ware India Ltd (HSIL) entered into residential air purifier business. These new entrants into air purifier business are expected to boost the growth of residential air purifier market. Moreover, leading market players of residential air purifiers are also running campaigns for creating awareness and to increase adoption of air purifiers as their marketing strategy in developing countries such as India, China, Brazil, Turkey, Malaysia and South Africa. For instance, in 2014, a digital awareness campaign through Facebook and YouTube is launched by Philips in China and India to create awareness about risk of indoor air pollution and requirement of residential air purifiers. Global residential air purifier market is estimated to reach USD 8.65 billion by 2024 and is projected to grow at a CAGR of over 6.0% during the forecast period i.e. 2016-2024. 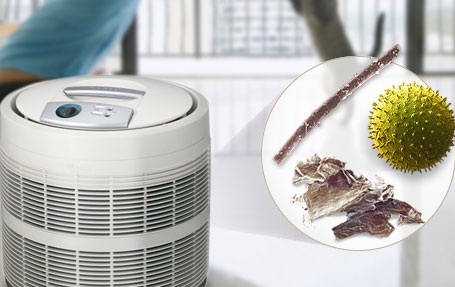 Rising personal disposable income of the population and growing health concern among the population are the two major factors which are driving the demand for residential air purifier market. Rapid urbanization across the globe, majorly in China, India, Russia, Canada, Brazil, UAE and other growing economies leads to increase air pollution in metro cities. On the basis of rising level of air pollution, population living in urban areas is adopting air purifiers. Based on product type segmentation, dust collector segment acquired 44% market share whereas fume & smoke collector segment accounted for 56% revenue share total residential air purifier market revenue in 2016. Based on technology segment, HEPA is an emerging technology and is expected to hold 82% market share of global market during the forecast period owing to the increasing level of air pollution and respiratory diseases incidents in countries such as China and India. Rising urbanization, changing lifestyle and increasing awareness towards indoor air pollution is boosting the residential air purifier market in Asia-Pacific region. Asia-Pacific is expected to dominate the global residential air purifier market over the forecast period. Frequent incidents of Middle East Respiratory Syndrome (MERS), sick house syndrome and outbreak of wine-origin influenza A (H1N1) in 2015 have raised public concern about these infectious diseases. Suffocating smog and yellow dust in China is hugely impacting health of local population. This is the major factor which is increasing the sales of residential air purifiers in countries such as China, South Korea and Japan. Asia-Pacific residential air purifier market is expected to reach USD 3.03 billion by the end of 2024, growing at a CAGR of 10.0% during the forecast period. North America dominated the global residential air purifier market in 2016, due to increased awareness about the benefits of indoor air pollution risk and early adoption of residential air purifiers. North America residential air purifier market is projected to reach value USD 2.60 billion by 2024, growing at a CAGR of 4.0% during the forecast period. However, Europe residential air purifier market is expected to witness steady growth owing to its established demand of residential air purifiers in countries such as Germany, Italy, the UK and Spain. Europe residential air purifier market valued USD 1.74 billion in 2016 and expected to witness modest growth over the forecast period. Rising investment for the development of environmental infrastructures and increase in adoption of residential air purifier products in countries such as Mexico, Brazil, Saudi Arabia and The United Arab Emirates (UAE) is likely to drive the residential air purifier market in Latin America and Middle East & Africa region. Rising prevalence of airborne diseases such as asthma, cancer and irritation and increasing awareness about chronic health issues caused due to indoor air pollution is accelerating the sales of residential air purifiers. Growing demand of energy efficient air purifiers by consumers is also one of the key factors which are propelling the growth of residential air purifier market. Moreover, increasing demand for HPEA filtration technology in residential air purifiers which efficiently removes the air pollutants and smoke from home is raising the adoption rate of advanced residential air purifier over conventional air purifier. High R&D investment with low profit margin is obstructing the growth of residential air purifier market. Stagnant growth of residential air purifier in developed regions such as North America and Western Europe is also hindering the market growth. Rising cost of raw material and low profit margin is affecting the business opportunities of residential air purifiers in mature markets such as North America and Western Europe.